With the country facing the H1N1 pandemic, it is best to be prepared and be informed of the myths and facts circulating it. Symptoms of swine flu and seasonal flu are very similar. Fact: Swine flu and seasonal flu have similar symptoms like fever, sore throat, cold, headaches, body aches, and at times even vomiting and diarrhea. Seek medical tests and advice to differentiate the type of flu you are suffering from. You should wait for 24 hours to go back to work, once you begin to feel better. Fact: H1N1 virus can spread a day prior to the manifestation of symptoms and up to 7 days from the start of infection. This virus can be active for much longer periods in children and in people with weaker immunity. I can contract swine flu by eating pork or by visiting a pig sty. Myth: Swine flu is spread in the same manner as seasonal flu. 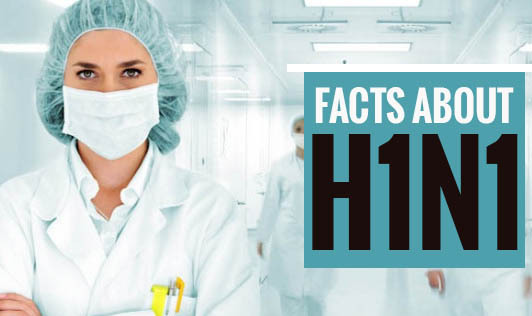 A person can contract H1N1 after coming into close contact of an infected person or by frequently rubbing their eyes, nose, and mouth after coming into contact with contaminated surfaces. Swine flu virus does not spread by consuming pork or through other foods. Wearing surgical masks at all times can protect you from H1N1. Myth: Surgical masks are not designed to prevent airborne disease. The virus can penetrate through the mask and infect the individual. Hand sanitizer is not as effective as washing hands. Myth: Using sanitizers whenever hand washing is not possible can prevent you from catching the virus. Studies have shown that hand sanitizers can effectively kill H1N1 virus. Hope these facts have helped you become more informed and vigilant. Stay updated on new developments and check for credibility of new information before believing it.